Fig. 1. Tarleton State University Herbarium space, 2018. Tarleton State University, located in Stephenville, Texas, U.S.A., was first established in 1899 under the name John Tarleton College. Its namesake, John Tarleton, was a wealthy businessman in Stephenville, Texas, who provided the endowment to support a college in his will. The school opened its doors to 145 students, offering preparatory and junior collegiate level classes led by four faculty members. With time, the college grew and became Tarleton Agricultural College. By 1973, the college was incorporated into the Texas A&M system. Its curriculum expanded to include four-year programs, and the college was reorganized under its current name Tarleton State University (TSU). TSU has come a long way from first opening its doors and now maintains six locations, over 13,000 enrolled students, and offers 94 degrees from associate to doctorate (David and Young, 2010). The Tarleton State University Herbarium, originally named Tarleton Agricultural College Herbarium, was established in 1921 and is a north-central Texas regional collection. Initially, the primary function of the collection was to provide and house teaching specimens, but now it consists of over 7,000 specimens representing over 850 taxa. TSU is located in the lower portion of the West Cross Timbers, a sub-ecoregion of the Cross Timbers and Prairies, and plants from this ecoregion are well-represented in the TSU Herbarium. However, the collection does not consist strictly of vegetation from the West Cross Timbers and varies geographically with specimens collected from throughout Texas and fourteen other states. It is a member of the Texas Oklahoma Regional Consortium of Herbaria (TORCH), which is a member of SEINet Regional Networks of North America databases. The Herbarium is currently digitizing its collection to fully participate in the TORCH and SEINet databases, but limited staffing over the years has slowed the project. Currently, roughly a third of the collection’s information is available online and digitizing the collection remains a priority. The herbarium is housed in the Lamar Johanson Science Building on the TSU main campus and functions as a teaching resource for the Department of Biological Sciences. 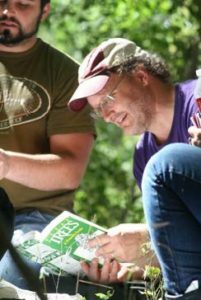 The current herbarium director is Dr. Allan Nelson, who also has actively added to the collection since starting at TSU in 1997. Nelson balances his duties as herbarium director with his responsibilities as department head for biological sciences and teaching courses in plant sciences. Fig. 2. Lupinus texensis, widespread Texas endemic, collected by Lula Gough. The herbarium’s more prominent collections include voucher specimens from floristic projects of the Padre Island National Seashore (PINS) and the Lula C. Gough Collection. Vegetative surveys conducted in 1996 and 1997 in three regions of PINS resulted in the seashore’s first checklist for vascular plants as well as a more focused The TSU Herbarium’s history is primarily a mystery. 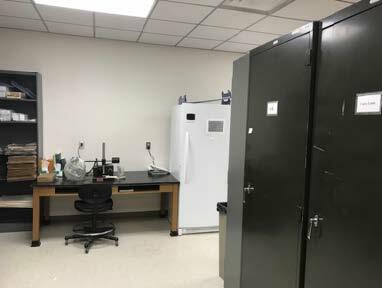 It persisted through a changing, growing campus as well as a monumental move when the Lamar Johannson Science Building was constructed in 2001, but the move left the herbarium with little to no records providing any comprehensive description of its past. What has persisted are the specimens that provide information on the people involved with the TSU Herbarium. Individuals are most influential through their specimens and some of the most prominent developers of the TSU Herbarium have been Nelson, Gough, and Clarence Mertins. Nelson, the current herbarium director (Fig. 3), is the most prolific contributor in the collection’s history. Under his direction beginning in 1997, the collection has expanded an estimated five times its size with the majority of specimens coming from his own projects. Nelson actively uses the TSU herbarium as a teaching tool for plant taxonomy and is consistently adding project voucher specimens to the general collection. Though other developers have contributed, no others compare to the sheer numbers compiled by his research teams. River at Johanson Ranch, 2003. Mertins, Instructor of Biology (1960–1965), provided a substantial amount of specimens to the herbarium, but it was the timing of his contributions that was most impactful. Prior to Mertins, the collections had hit a proverbial dry spell with no substantial acquisitions between 1930 and 1960, and it was the efforts of Mertins that revived the functionality of the herbarium. Mertins’ specimens varied far from Erath County to include material from the Davis Mountains in the far west, the northern reaches of the panhandle, and to the Sam Houston National Forest at the base of the Piney Woods in the east. In 1963, Mertins was awarded an NSF research fellowship to work with Dr. U.T. Waterfall out of Oklahoma State University and returned with several Oklahoma specimens for the collection (Gresham, 1963). Mertins left TSU in 1965, but his efforts set the trend and contributed to make the 1960s the second most productive decade in terms of growth for the herbarium. Fig. 4. Lula Gough, Associate Professor in Biology, Tarleton State University yearbook photo 1921. Gough, Associate Professor of Biology (1921–1950), was the first to publish a flora for Erath County, Texas. Her vouchers, which are housed in the TSU Herbarium, provided the first material to establish TSU herbarium, but Gough is also the most prolific female contributor to the herbarium. She was a well-respected professor during her tenure at the University and spent almost 23 years as the sole female professor in the Biology Department. Gough taught courses in botany for 30 years and used the herbarium frequently for her courses to engage her students in topics of taxonomy and general plant science (Summers, 1950). People play vital roles in any natural history collection, but in smaller, regional collections, such as at Tarleton State University, a single individual can leave lasting influences and truly shape a herbarium. Thus, the TSU Herbarium has acted as an archive for ecological, botanical, and anthropological data due to its dedicated collectors for decades. Those of us involved in the herbarium hope for more decades of growth and development with help from professors and students alike. Davis, J.T.and N.B. Young. 2010. Tarleton State University. Handbook of Texas Online, accessed May 22, 2018, https://www.tshaonline.org/handbook/online/articles/kct02. Gresham, E., editor. “Awards Are Won By Biology Profs.” The J-TAC [Tarleton State University; Stephenville, TX], 26 March 1963, p. 6. Negrete, I.G., C. Galloway, and A.D. Nelson. 2002. Noteworthy plants associated with the Gulf Coastal Bend of Texas. Texas Journal of Science 54: 241–248. Nelson, Allan, photographer. “[Dr. Allan Nelson collecting on Colorado River at Johanson Ranch. ]” Photograph. 2003. Unpublished, personal photo. Nelson, Allan, photographer. “[Lupinus texensis, widespread texas endemic, collected by Lula Gough. ]” Photograph. 2018. Unpublished, personal photo. Nelson, Allan, photographer. “[TSU Herbarium space. ]” Photograph. 2018. Unpublished, personal photo. Nelson, A.D., T. Cotton, S. Brown, P. Cowley, S. Harsley, and C. Rosson. 2018. Additions to the flora of Erath County, Texas. Journal of the Botanical Research Institute of Texas. In review. Nelson, A.D., J.R. Goetze, and A. Lucksinger. 2001. A comparison of the flora of northern Padre Island to that of Matagorda Island, Mustang Island and southern Padre Island, Texas. Occasional Papers, Museum of Texas Tech University 209: 1–23. Nelson, A.D., J.R. Goetze, I.G. Negrete, V.E. French, M.P. Johnson, and L. Macke. 2000. Vegetational analysis and floristics of four communities in the Big Ball Hill region of Padre Island National Seashore. The Southwestern Naturalist 45: 431–442. Summers, H., editor. “Too Bad!” The J-TAC [Tarleton State University; Stephenville, Tx], 2 May 1950, p. 2. Tarleton State University Herbarium (TAC). 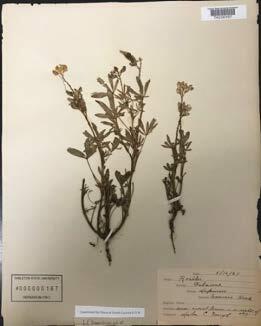 Consortium of Northern Great Plains Herbaria, http://ngpherbaria.org/portal/collections/misc/collprofiles.php?collid=158. Accessed 1 June 2018. 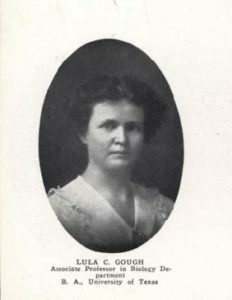 Yearbook Photo: Lula Gough. 1922. Tarleton State University: The Grassburr. Portal to Texas History, https://texashistory.unt.edu/ark:/67531/metapth541983/m1/28/?q=Lula%20Gough. Accessed June 2018.